Besides the tablet-optimized Photoshop Touch, Adobe had other big news for Android fans last night. 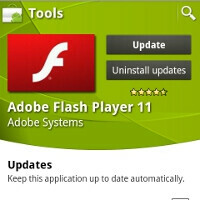 It made the new Adobe Flash Player 11 and AIR 3 available for download from Android Market after midnight for everyone who has befriended the little green robot. The press release with the full changelog is listed below, but the main improvements are better compression, which can reduce SWF files by up to 40%, thus improving bandwidth consumption, support for the superior JPEG-XR format and higher resolutions, and the improvement of protected streaming to resolve DRM issues. The big thing everyone was waiting for is Stage 3D, though, which promises to harvest advanced 2D and 3D graphics acceleration for a significant boost in Flash video and games performance. Stage 3D will be provided for mobile devices at a later date, however, for now it is only available on the desktop. If Adobe manages to somehow leverage Flash Player 11 to take full advantage of the dedicated GPUs on mobile devices, and does it without hogging too much battery juice, then it might just prove Flash will stay relevant for quite some time still, making its exclusion from iOS quite the annoyance. We'll save judgement for when the Stage 3D update hits Android Market. Stage 3D Accelerated Graphics Rendering (Player & AIR desktop + AIR for TV) — Stage 3D is a new architecture for hardware accelerated graphics rendering developed that provides a set of low-level APIs that enable advanced 2D and 3D rendering capabilities across screens and devices (desktop, mobile, and TV). Using Stage 3D, app and framework developers can now access high performance GPU hardware acceleration, enabling the creation of new classes of rich, interactive experiences. Note: Stage 3D for mobile versions of Flash Player & AIR will be enabled in a future release. Flash Access Content Protection Support for Mobile — Flash Access content protection support is now available on mobile devices including Android powered smartphones and tablets. In addition, content protection is now supported on tablet devices powered by the BlackBerry® Tablet OS. Note: Flash Access for iOS is not supported at this time. Flash Access Content Protection Enhancements — New Flash Access content protection features include key rotation support, V3 license chaining, domain support and enhanced output protection and device filtering. Protected HTTP Dynamic Streaming (HDS) — Protected HTTP Dynamic Streaming (HDS) provides protection for streaming video across screens while eliminating the deployment complexity of a license server. NetStream.dispose() — Similar to NetStream.close() except that it also clears up the last frame held up by NetStream to be displayed on the Video object. Use this instead of NetStream.close() if the NetStream is to be re-used for other streams later. It enforces garbage collection of the video frame and related decompressor objects. The video object will display a blank frame after the use of this method. H.264/AVC Software Encoding for Cameras (desktop) — Stream high-quality video from your computer's camera with higher compression efficiency and industry stanard support, enabling both immersive real-time communications such as video chat/conferencing and live video broadcasts. JPEG-XR support — Flash Player and AIR now include support for the JPEG-XR advanced image compression standard (International Standard ISO/IEC 29199-2). The computationally lightweight JPEG-XR format provides more efficient compression than JPEG, enables both lossy and lossless compression support, and adds support for alpha channel transparency. Enhanced high resolution bitmap support — BitmapData objects are no longer limited to a maximum resolution of 16 megapixels (16,777,215 pixels), and maximum bitmap width/height is no longer limited to 8,191 pixels, enabling the development of apps that utilize very large bitmaps. High efficiency SWF compression support — Developers can now take advantage of LZMA compression for their SWF files. LZMA compression can reduce SWF size by up to 40%, enabling users to benefit from richer experiences with shorter download times and reduced bandwidth consumption. G.711 Audio Compression for Telephony — Support interoperability with legacy phone systems via the Flash Media Gateway (FMG) and other third-party clients (through the open RTMP protocol) without the need for transcoding. Garbage Collection Advice — Provides smoother, more responsive user experiences by allowing developers to provide hints to optimize garbage collection scheduling. Cubic Bezier Curves — The cubicCurveTo drawing API allows developers to easily create complex cubic Beziers without requiring custom ActionScript code. Secure Random Number Generator — Developers can now take advantage of cryptographically secure random number generation to build more secure algorithms and protocols..
Socket Progress Events — Improve management of data transfer using the Socket class by providing a new property to determine the number of bytes remaining in the write buffer and a new event for when data is being sent to the network layer. Using these new APIs, developers can build applications such as file transfer utilities that monitor socket progress and provide responsive feedback. DisplayObjectContainer.removeChildren and MovieClip.isPlaying — DisplayObjectContainer now implements a removeChildren API allowing developers to quickly remove all of a container's children using a single API call. A new MovieClip.isPlaying property returns the MovieClip's current playing state. Native 64-bit Support (Flash Player desktop) — Take advantage of native support for 64-bit operating systems and 64-bit web browsers on Linux, Mac OS, and Windows. Asynchronous Bitmap Decoding (new for Flash Player) — Improve app responsiveness and deliver smoother animation by decoding images on initial load instead of on demand. Images are cached as needed. TLS Secure Sockets Support (new for Flash Player) — Enables secure communications for client/server applications. Native Extensions — Native extension libraries allow developers to create and use native libraries that can be invoked using ActionScript. These libraries allow ActionScript developers to take advantage of the same platform and device-specific native capabilities and APIs available to native apps, with easy integration into AIR applications. In addition, native extensions can be used for performance critical code or porting existing native libraries like image decoders for use within an AIR application. Captive Runtime Support — This popular feature from AIR for iOS is now available with AIR for desktop, Android and TV. Simplify the app installation process and reduce testing/certification cost by packaging the AIR runtime with your app on Windows, Mac, Android and TVs. Stage Video Hardware Acceleration (AIR Mobile) — Leverage hardware acceleration of the entire video pipeline to deliver efficient, best-in-class high-definition (HD) video playback experiences. Decrease processor usage and enable smoother video, reduced memory usage, and higher fidelity on mobile (supported on Android 3.1, BlackBerry Tablet OS, and iOS) and TV devices. H.264/AAC Playback Support (AIR for iOS) — Enables H.264 & AAC playback on iOS when using Stage Video Hardware Acceleration. This feature requires that video be delivered either through progressive download or HLS. RTMP is not supported due to platform limitations. Front-facing Camera Support (AIR for Android) — The front-facing camera support available with AIR for iOS and BlackBerry Tablet OS is now available on Android devices. Take advantage of the front-facing camera to help users connect with rich video conferencing and chat experiences on smartphones and tablets. Background Audio Playback Support (AIR for iOS) — Developers can now write multitasking iOS applications that can play audio while in the background, such as music applications or reliable voice conferencing apps with multitasking support. Device Speaker Control for Mobile (AIR for iOS & Android) — Provides developers the ability to select whether audio should be outputted through the phone speaker or external speaker. 16 and 32-bit color depth — Provides an app descriptor setting for developers to control the color depth of graphics on Android (16bit and 32bit) for renderMode=cpu/auto. AIR 2.7 and older namespaces will default to 16bit color, whereas AIR 3.0 and newer namespaces will default to 32bit. Game Controller API (AIR TV) — Allows developers to build TV applications that can communicate with an attached game input devices such as a gamepad or controller wand. Note: This capability is not yet available on AIR for desktop or mobile. Flash is getting faster! Wonder Woman is getting sexier! GREEN SCREEN?? HMM? on LG THRILL. i'll care when we get Stage 3D support.